In the afternoon, when Esme came back from picking up the children she had a small surprise for me: a snake. On the way back from school she and the children had spotted a snake on the road. She had managed to lift the snake using a pencil and put it in a paper bag she was carrying. Most likely she had taken it with her to cheer me up. I had had a few bad days, and certainly needed a little distraction. When I looked into the bag I recognized the specimen as an earth snake: Geophis semidoliatus. 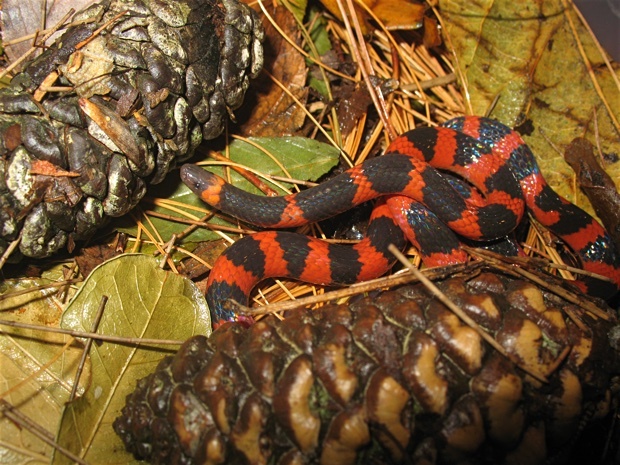 It resembles a coral snake but is harmless. Close-up of a Geophis semidoliatus. The children's grandmother had recently given them a small cage for studying insects, and of course both Adam and Alice wanted to observe the snake inside the cage. So, I transferred the snake to the cage and went to my office to prepare a more suitable make shift enclosure until we could release the snake in the same location the next day; I had no plans keeping it. 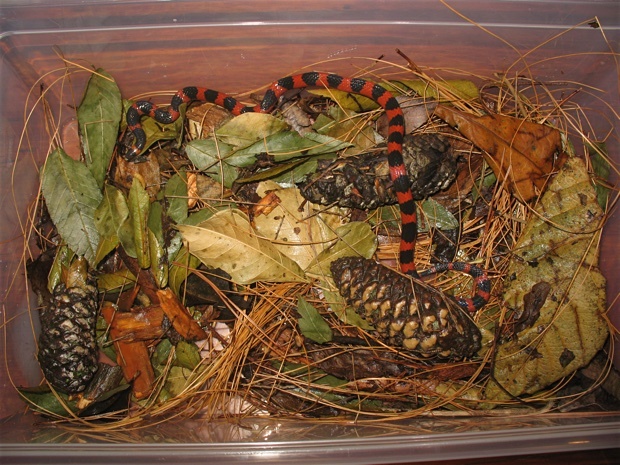 The earth snake, Geophis semidoliatus, in a plastic storage box. I used an IRIS 6 quart modular plastic storage box as an enclosure. Recently Alice had collected some dead leaves and other dead plant material which I used to provide some layer the snake could hide within. I put quite some weight on top of the lid to prevent the snake from escaping and possibly hurting itself in the process. 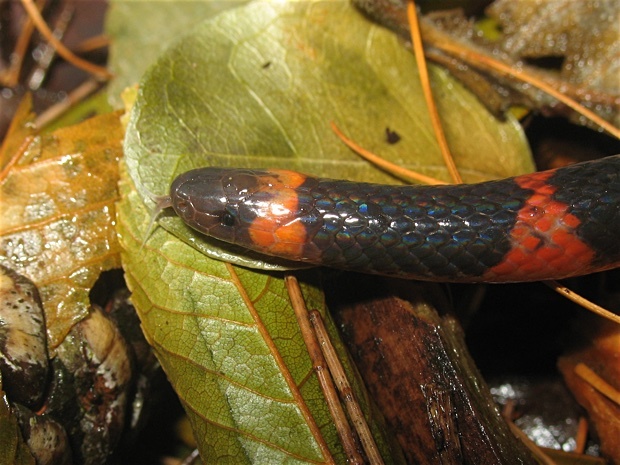 A close-up of the head of Geophis semidoliatus. A few years back I had seen a specimen of the same species, hiding under garbage. But it was much smaller. The specimen Esme and the children had collected is well over 30cm. Tomorrow, we will release the snake near the end of the day, in the same location, taking care to release it where it is less likely to encounter humans as a lot of snakes are killed out of ignorance, on sight. Especially snakes as colorfull as this earth snake.